Alderwoman Adella Gray introduces a proposed civil rights ordinance on the steps of the Fayetteville Town Center. Alderwoman Adella Gray led a news conference from the steps of the Fayetteville Town Center Friday morning to announce a proposed new civil rights law. The new law, called the Uniform Civil Rights Protection ordinance, is sponsored by Gray and Ward 2 Alderman Matthew Petty. It would prohibit business owners and landlords from unjustly firing or evicting someone because of their sexual orientation or gender identity. It would also provide protections for use of public accommodations, such as restrooms. If passed, the ordinance would not go into effect unless voters approve the measure in a special election to be held Sept. 8. Churches, religious schools and daycare facilities, and religious organizations of any kind would be exempt from the new law. Unlike the previous civil rights ordinance that was approved by aldermen and then later repealed, the city attorney would not serve as the administrator of complaints. Instead, a Civil Rights Commission would be formed to review and decide complaints of alleged discrimination. Joining Alderwoman Adella Gray at the podium Friday were (from left) Chaz Allen, president of the NWA Center for Equality; Steve Clark, president of the Fayetteville Chamber of Commerce; Mark Martin, an attorney at the Martin Law Firm; Danielle Weatherby, Assistant Professor of Law at the University of Arkansas; Lowell Grisham, rector of St. Paul’s Episcopal Church; Clint Schnekloth, lead pastor at Good Shepherd Lutheran Church; and Matthew Petty, Fayetteville alderman in Ward 2. Gray said work began toward a new proposal shortly after the original ordinance was defeated at the polls. 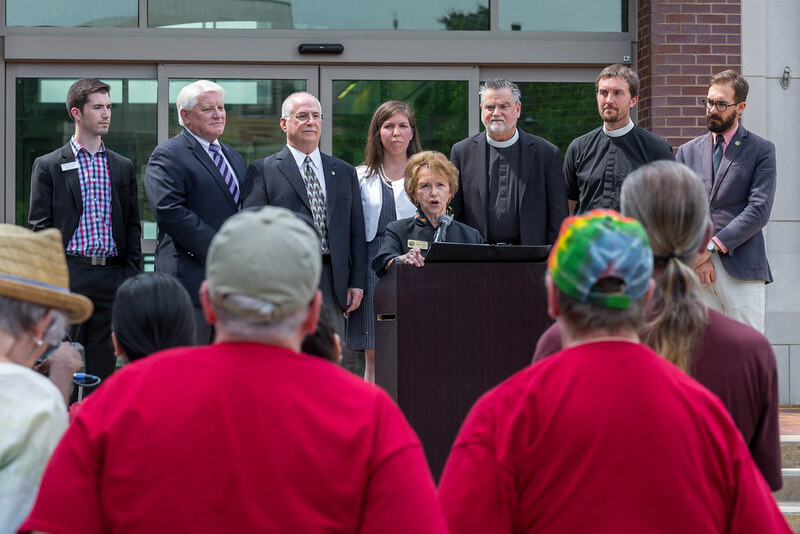 “Ever since the adoption of the original civil rights ordinance, and then its repeal, I have been thinking about how can we bring Fayetteville together to announce on record that our city protects the rights of everyone,” said Gray. Gray said after talking with residents, business owners, and faith leaders, she believes most Fayetteville voters support the vision of the original ordinance, but some felt it wasn’t a good fit for the community. Unlike the previous ordinance, the new proposal incorporates several existing laws like the Arkansas Anti-Bullying Act and the Fair Housing Act. It also borrows language from the Arkansas Civil Rights Act of 1993, which defines “employer” as a person who employs nine or more employees in the state. 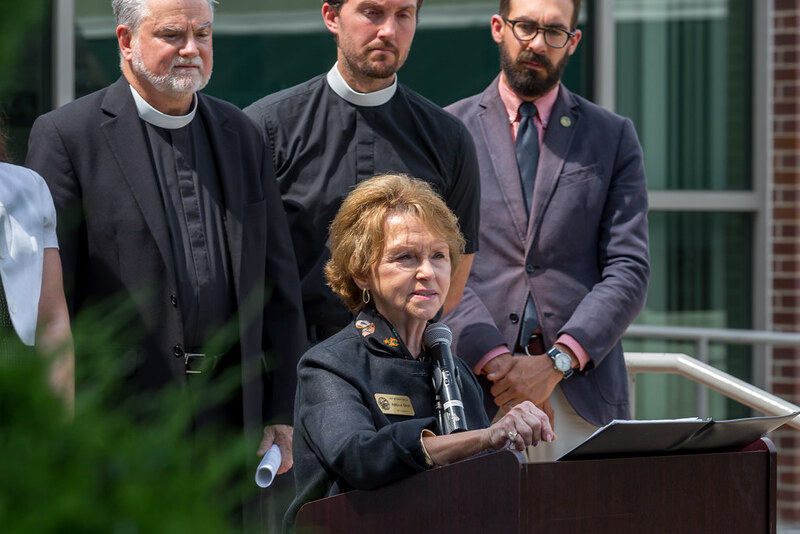 She said the new ordinance has support from the Fayetteville Chamber of Commerce, a group that campaigned for repeal of the original ordinance, which was drafted using language from the Washington-based Human Rights Campaign as a starting point. Chamber officials, including president Steve Clark, criticized the measure in November and called it “legally incomplete” and “vague” in its language defining the ordinance. 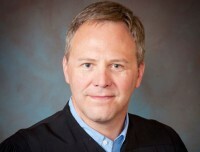 Gray said the new proposal, which specifically outlines claim submission, hearing procedures, and order of penalties, was drafted with help from local attorney Mark Martin of the Martin Law Firm, and Danielle Weatherby, Assistant Professor of Law at the University of Arkansas. That, she said, was enough to convince chamber leadership to support the new law. Clark was one of several people standing alongside Gray as she announced the new proposal Friday morning. Gray said after months of work, she hopes other rivals of the original ordinance will also come out in support of the new law. Alderman John La Tour, who was a vocal opponent of the measure during his campaign for election to the City Council last fall, said he would not support any new version of the ordinance. “The people voted it down, and the city brought it back. How does that make any sense?” asked La Tour. He said the exception for religious organizations will not satisfy opponents. “A Christian business owner who condones homosexuality like it says in the bible would be penalized for doing so, and that’s simply wrong,” said La Tour. La Tour said the City Council should be focusing on supporting infrastructure, and the police and fire departments instead of addressing civil rights issues. “These types of discussions should take place in community meetings and bible study classes, not in government,” said La Tour. The legality of Gray and Petty’s proposal will likely be an issue in the coming weeks. Fayetteville City Attorney Kit Williams said the new ordinance doesn’t conflict with state law. He referenced an argument used by Little Rock City Attorney Tom Carpenter when Little Rock was considering a civil rights ordinance in April. Carpenter cited portions of Title 6, Chapter 18 of Arkansas Code, which prohibit bullying in public schools on the basis of several classes, including sexual orientation and gender identity. Because those protected classes already exist, Carpenter opined, a municipality would not be in violation of Act 37 by adopting nondiscrimination policies based on those classes. Williams said he hasn’t yet drafted his own legal analysis, but said Carpenter’s arguments would also apply to the proposed new law in Fayetteville. “I certainly would be prepared to defend the legality of the Gray / Petty ordinance in court if opponents file suit (which is likely),” said Williams. 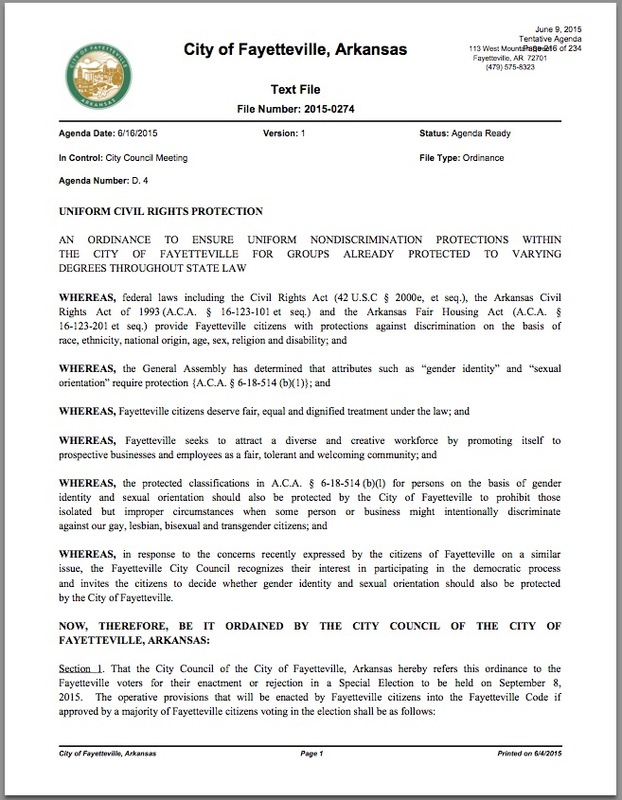 Three cities have passed nondiscrimination measures since Fayetteville’s ordinance was repealed. 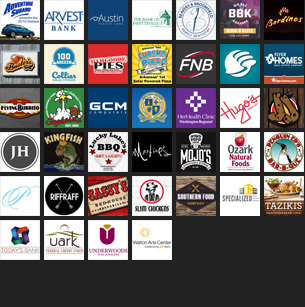 Policies enacted in Little Rock and Hot Springs only apply to municipal employees and contractors seeking to do business with the cities. An ordinance passed in Eureka Springs – and was later upheld by voters – is similar to Fayetteville’s proposal, which extends protections to employees and tenants of private business owners. The new proposal is on the agenda for an initial reading at the next regular City Council meeting on June 16.